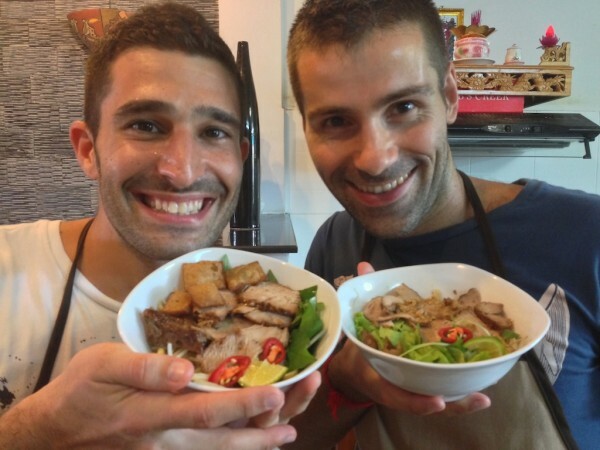 Vietnam is a foodie’s paradise with a variety of unique flavours and specialties. This is our favourite 10 traditional foods of Vietnam, which we fell in love with. Pho (pronounced “Fur”) is The traditional food of Vietnam and known throughout the world. It is usually a chicken (ga) or beef (bo) broth with thin rice noodles and various herbs. 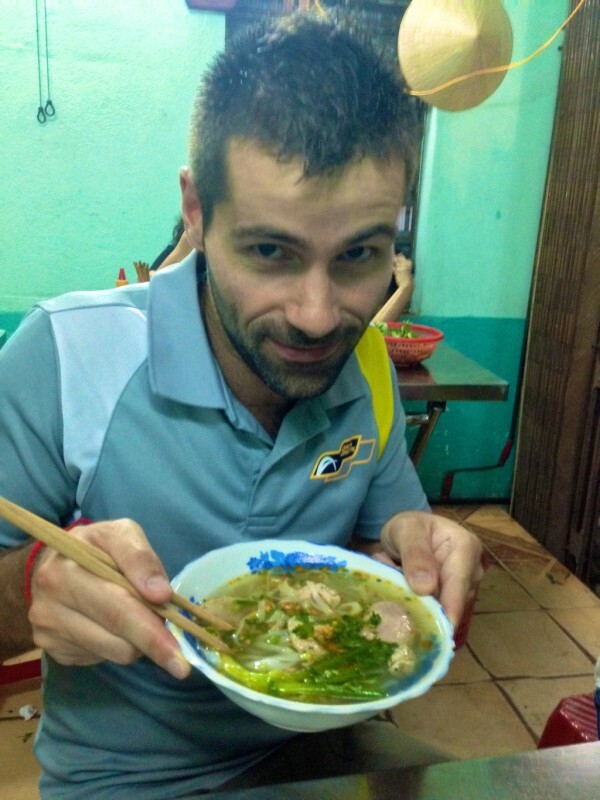 Sebastien's first Pho-to…he he he…see what we did there? Pho originated in the early 20th century in North Vietnam and spread around the world via refugees who fled during the Vietnam War years. A yummy variant of Pho is “Bun Bo Hue” from the Central Vietnamese city, Hue using rice vermicelli (instead of rice noodles) and served in a delicious shrimp and lemongrass based broth. 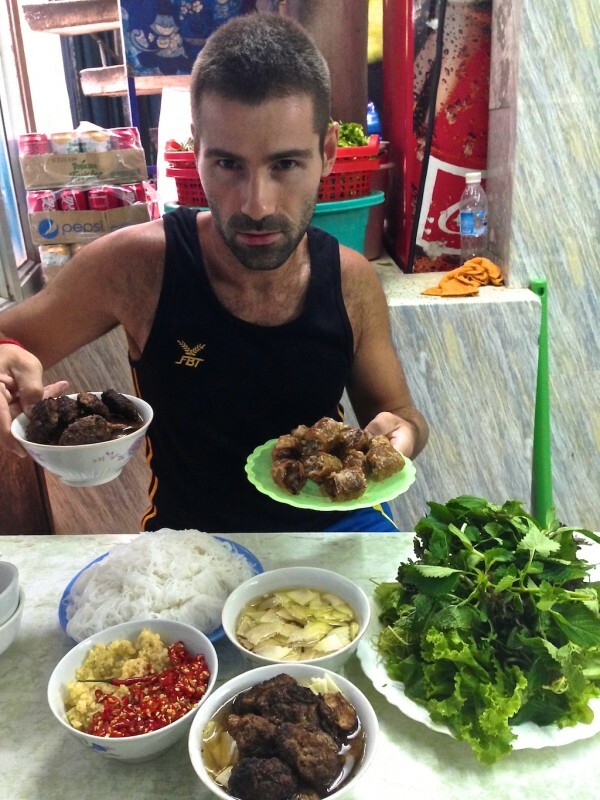 Cao Lau is the signature dish from the Central Vietnamese town of Hoi An and one of Stefan’s favourite traditional foods of Vietnam. The recipe for Cao Lau includes a plate of thick dark rice noodles served in small amounts of richly flavoured broth, topped with pork slices, bean sprouts, greens, herbs and deep-fried croutons. The noodles make this dish unique because they are darkened after being soaked in ash water from a specific tree found only in the nearby Cham Islands. Mi quang is another popular Central Vietnamese noodles dish, similar to Cau Lao, but the noodles are flat white and tinted yellow by the addition of turmeric. The protein source varies from beef, chicken, beef, pork or shrimp. It is topped with herbs, crushed peanuts and a hard-boiled egg. 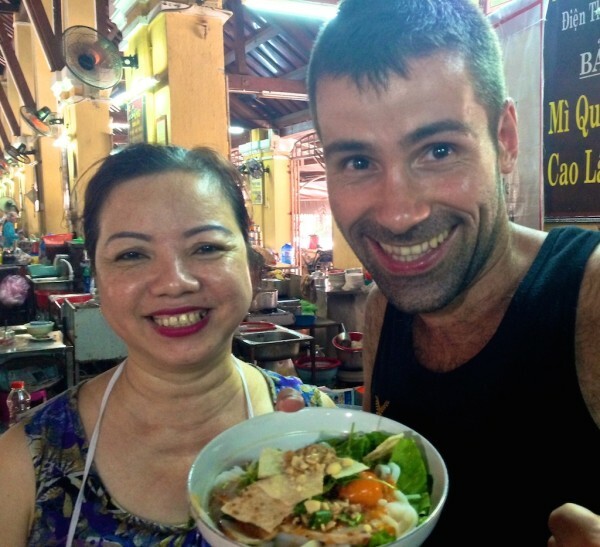 Mi quang was one of Sebastien’s favourite traditional foods of Vietnam and if you find this sweet lady in the Hoi An local market, her mi quangs are one of the best. Bun cha is a grilled pork based dish served with vermicelli, fresh herbs, vegetables, fish sauce and chopped spring rolls. It originated from Hanoi and spread across Vietnam. It is served with everything presented in separate bowls (one for the grilled pork, another for the vermicelli, another for the herbs, the chopped garlic and the pickled vegetables) and you assemble it yourself. It is not the healthiest traditional food of Vietnam but a very tasty one! Spring rolls are notorious throughout Vietnam and are either deep-fried with minced pork or served fresh. 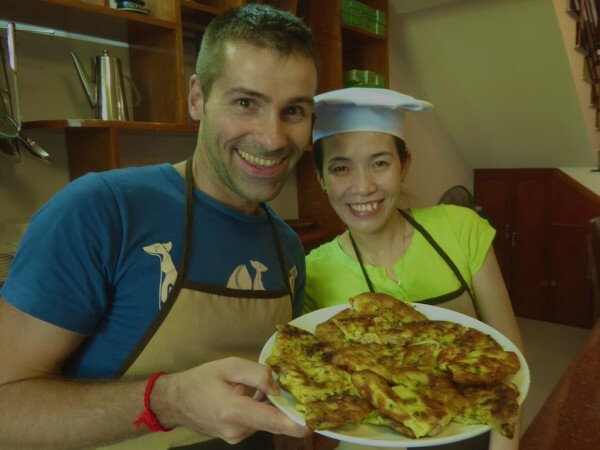 The deep fried version is crispy, yummy but not very healthy: we learnt to make deep fried spring rolls during our cooking course in Hoi An and lots of oil was used. 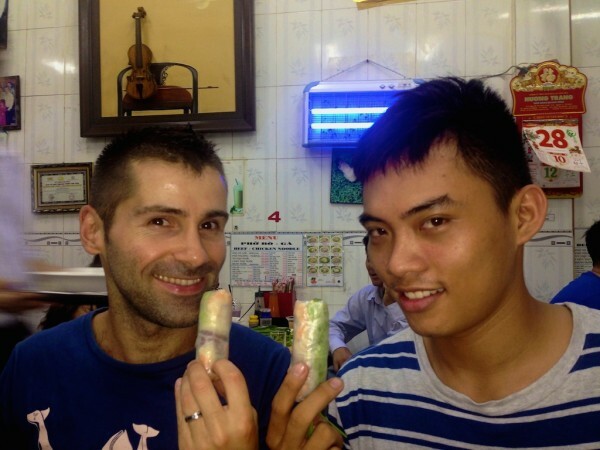 We preferred fresh spring rolls, also called “garden rolls”. The ingredients are cooked beforehand and then wrapped in rice paper and served with a dipping sauce like fish or peanut sauce. No deep frying involved here! Banh xeo are deep fried savoury pancakes. The recipe for banh xeo includes pork, egg, shrimp and bean sprouts. The name Banh Xeo literally means “sizzling cake” because of the sound the rice batter makes when it hits the pan. 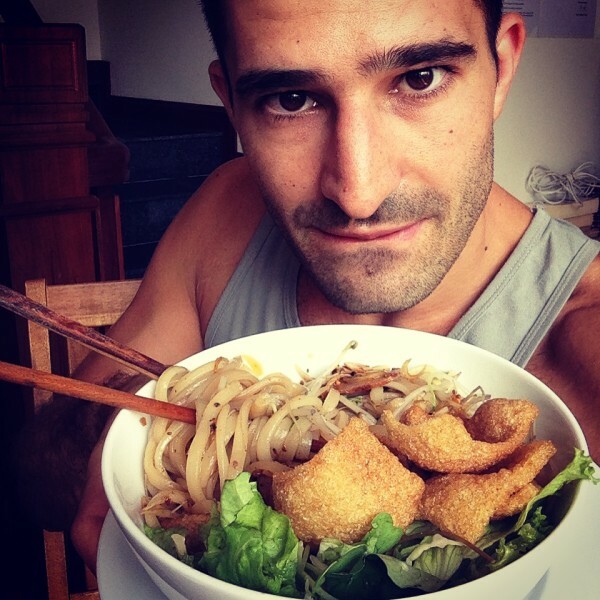 This traditional food of Vietnam is great for an afternoon snack. White Rose (or ‘banh bao vac’) is another traditional food of Central Vietnam. They are shrimp dumplings, bunched up to look like a rose. They are then steamed and served with a fish sauce for dipping. 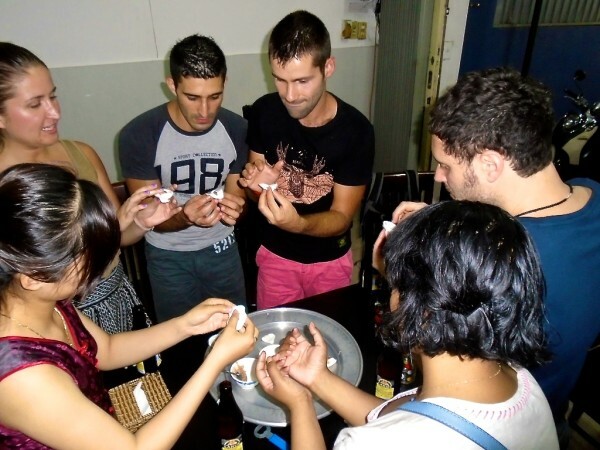 We learnt to make white roses during our foodie tour in Hoi An on a vespa. The technique is quite complicated and takes many years to master. Com tam (‘broken rice’) is a traditional street food snack from Saigon (South Vietnam), made from fractured rice grains and served with grilled pork over the rice, various plates of greens, pickled vegetables, an egg, fish sauce and a small bowl with broth. 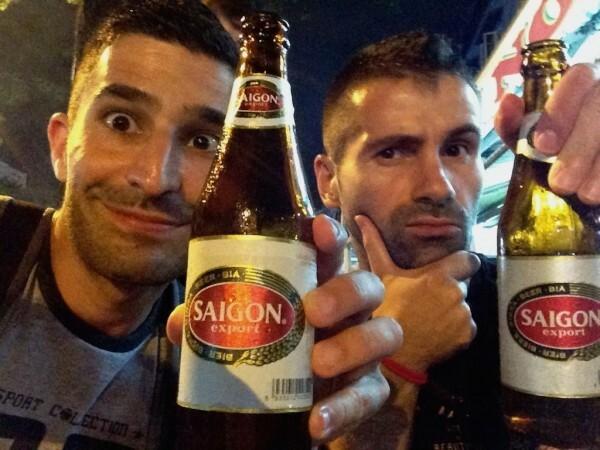 We tried a few com tams in Saigon with our friend Quan. #9 Vietnamese coffee: the best ever! Vietnam is THE place for coffee lovers. It is the second largest producer of coffee (after Brazil) and boy is it good! 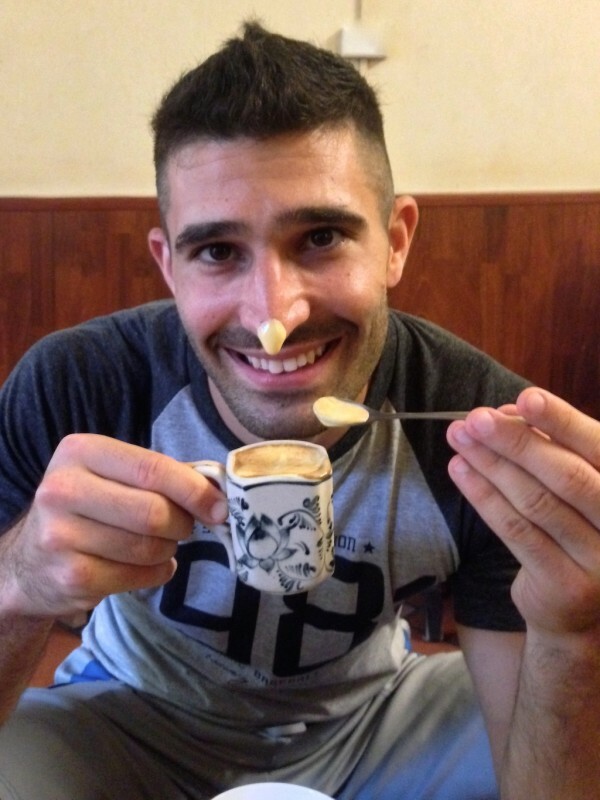 Traditionally coffee in Vietnam is served either hot or cold and sweetened with plenty of condensed milk. The iced version makes a very refreshing snack during the humid months, particularly in the South. There is a popular variant in Hanoi called egg coffee (ca phe trung), made with the addition of egg yolks and condensed milk. They are frothy, fun to drink and taste like tiramisu. 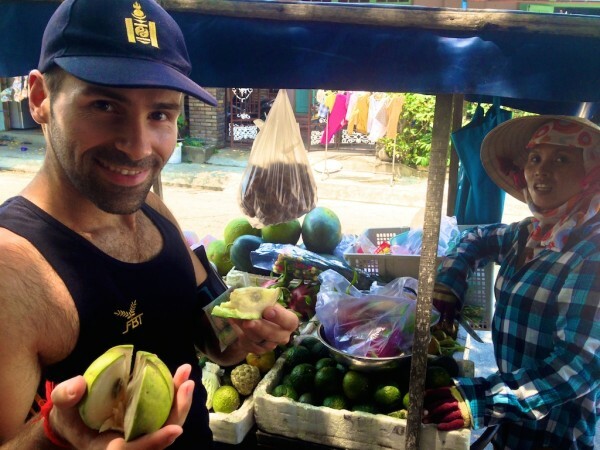 But in Hoi An we stumbled upon a new fruit we’ve not yet come across: the breast milk fruit! (Also known as Star Apple or Vu Sua). Star apples are juicy and sweet. They are so nicknamed because as you peel them, a few white milky drops dribble out! If you were to down it you would cry out: “MOT HAI BA YA!” – meaning 1, 2, 3, drink! Flying in Vietnam: Airfares in Vietnam can be very cheap if you do your research and book in advance. For example, flights from Ho CHi Minh to Hanoi come as low as $30 (£25) one-way. We recommend using Skyscanner to find the best prices for any given month. Visa in Vietnam: Depending on your nationality and the number of days you plan to stay in the country, entry requirements may be different. We recommend using the services of a reputable agency such as www.vietnam-visa.com to obtain your visa. Travel insurance: Whether you go diving, hiking or just lay on the beach all day long, you need travel insurance. We use World Nomads because they offer considerable coverage especially for adventurous travellers. They also make it easy to make a claim as it's all done online. Hotels: Vietnam has a huge diversity of accommodation options. We recommend Tripadvisor to research about the best places to stay and activities to do. Use Booking.com to find the best deals and book your accommodation online. Tour operator: We travelled independently to Vietnam but we're often asked if we can recommend a good tour company. We've partnered up with Ocean Travel, a gay friendly tour company who offer luxury private tours and tailored itineraries to Vietnam. 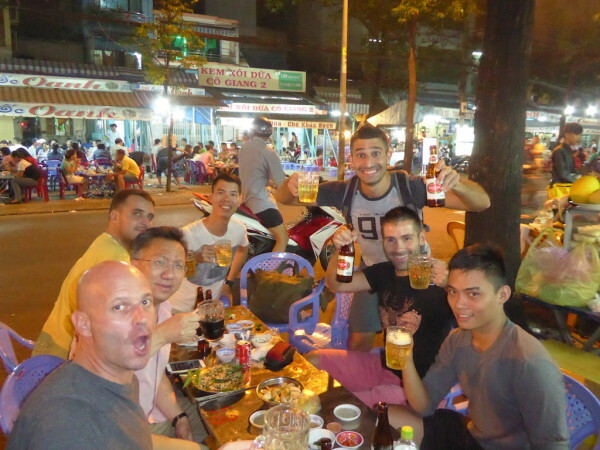 They also offer gay tours to Saigon. We have negociated for our readers an exclusive 5% discount for bookings of 7 days or more when you quote NOMADIC5 in your enquiry. 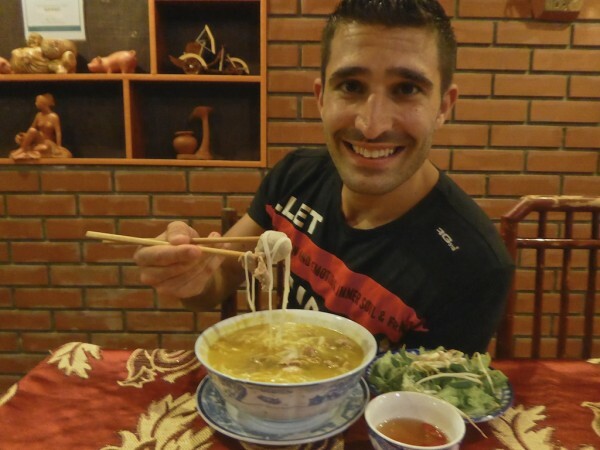 Travel with us as we made our way from Saigon up to Hanoi in our Vietnam travel video. That food looks delicious, especially those savoury pancakes! 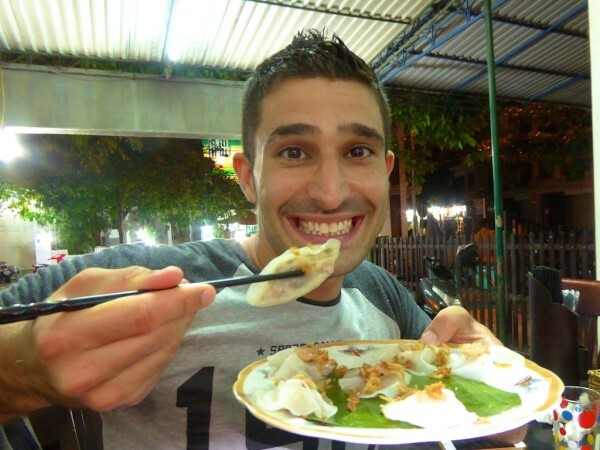 I’m going to Vietnam this summer and I hope I’ll try some of that food. You guys should try the green papaya salad in Vietnam. Not sure if it’s a traditional food but they serve some of the best. I like the Vietnam version of the salad better than the Thai version probably because of the awesome fish sauce, dried cuttlefish slices and hint of lemongrass and herbs. To this day we still talk about vietnamese coffee. Ice cold on a hot day and with condensed milk! YES please! Don’t think we ever had the one with egg. Did you like it better with or without?